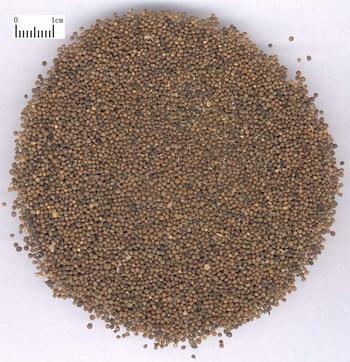 The dry ripe seeds of annual herbaceous plant Perilla frutescens (L.) Britt of family Labiatae. Jiangsu, Zhejiang and Hebei provinces and so on in China. Collect ripe seeds in autumn, cut whole plant or its ear to get fruit, and remove impurities. Aromatic smell when crushed, slightly pungent taste. Yellowish white kernel, rich oil, light fragrance, large, full and even shape, grayish brown colour and without impurities. Dried in the sun; unprocessed or slightly stir-baked; smashed. Pungent, warm; lung and large intestine meridians entered. Direct qi downward and resolve phlegm, relieve cough and dyspnea, moisten intestines for relaxing bowels. It excels at directing qi downward and resolving phlegm. Cough and dyspnea can be treated when adverse rise of qi is checked and phlegm is resolved. So it is an effective herb for cough and dyspnea caused by adverse rise of qi and phlegm retention in the lung. It is combined with herbs to treat cough and dyspnea due to both external contraction and internal injury. For cough and dyspnea due to adverse rise of qi and phlegm obstruction manifested as oppression in chest and poor appetite, it is often combined with Bai Jie Zi and Lai Fu Zi in San Zi Yang Qin Tang from Han Shi Yi Tong. For chronic cough and dyspnea due to upper excess and lower deficiency, it is often combined with kidney-warming, cold-dispersing, phlegm-resolving and qi-driving downward herbs. For instance, it is combined with Rou Gui, Dang Gui and Ban Xia and so on in Su Zi Jiang Qi Tang from Tai Ping Hui Min He Ji Ju Fang. For cough and dyspnea due to wind-cold and phlegm-heat congestion the interior, it is often combined with lung-ventilating and lung-clearing herbs. For instance, it is combined with Ma Huang and Sang Bai Pi and so on. Being moist and full of oily contents with action of moistening dryness to relax bowels, it also can direct qi downward to improve the conduction of large intestine. It is good at treating constipation caused by intestine dryness and usually combined with lubricant laxatives such as Huo Ma Ren, Gua Lou Ren and Xing Ren and so on. Decoct 5~10 g. Take in powder or pills. It should be used with cautions for cough and dyspnea due to yin deficiency or loose stool due to spleen deficiency.